David Andres Leon is an architect with particular expertise in computational design and robotic fabrication. He is the co-founder of Barcelona-based office LEAP which focuses on the research of data-driven design and the development of bespoke computational tools for the building industry. David holds a Master of Science Degree from the Institute for Computational Design and Construction (ICD) in Universitat Stuttgart and a Masterís Degree in Advanced Design and Digital Architecture from the Escola Superior de Disseny i Enginyeria de Barcelona (Elisava). He has been involved in several research undertakings of which stand out his participation in German research platform FAT-LAB in Stuttgart and his collaboration as a research assistant in the Centre for Information Technology and Architecture (CITA) for the EU-Horizon 2020 Future and Emerging Technologies Proactive Action project Flora Robotica. 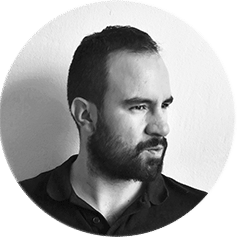 David is also the co-author of publications in the field of architectural research and robotics published in renowned platforms in the field.